Fully customized production solutions meet or exceed the highest performance and quality standards set by our clients. Specialty items for machines, pumps, valves, control instrumentation manufacturers. Customization is what we do best! 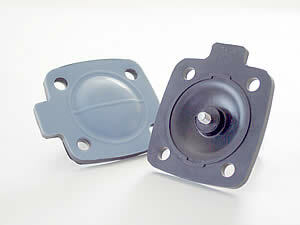 Customized molded bonding services for a wide range of dynamic applications. 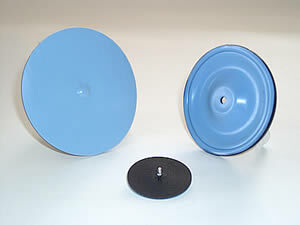 Roller ski wheel (far left) with bonded plastic hub that undergoes severe shear and compressive stresses during use without failure. 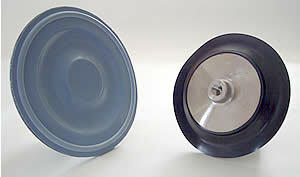 Highly dependable diaphragm (right) with bonded plastic inserts that undergo millions of tensile and compressive stress cycles without failure. 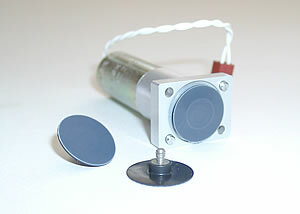 Tempron shares in the patented process for the manufacture of this Teflon™ lined gauge isolator. The unique feature of this isolator is that the annular space for the gauge fluid is formed in the molding process, when rubber is bonded to the Teflon™ and the isolator body. These high quality, Teflon™ faced diaphragms pump millions of strokes without the Teflon™ cracking or delaminating from the fabric reinforced rubber. The example shown combines a special Telflon™ film, Hypalon® rubber, polyester fabric, and glass filled nylon insert to form a multi-component, durable chemical metering pump diaphragm. This highly reliable diaphragm operates 24/7 at full pressure, with maximum speed and output. It is lab-tested to exceed 200 million cycles – twice the ISO warranty. Our integrated, bonded insert design eliminates the problematic leaks around the shaft prevalent in many of the current bolted-on styles. 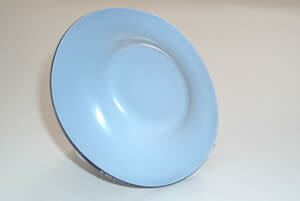 These diaphragms provide a higher level of reliability than PTFE sheets with rubber backing. 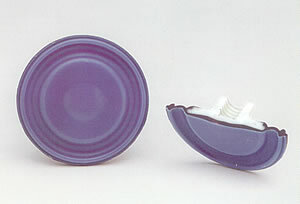 A PTFE bonded fluorocarbonelastomer diaphragm used to dispense either ultra pure fluid or highly aggressive chemistry. Applications: valving for diagnostic instrumentation; biomedical, pharmaceuticals, or microchip processing. 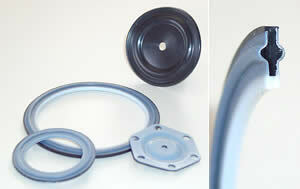 PTFE bonded elastomer diaphragms for air operated valves or pressure control. Applications: Plastic piping systems or chemical processing facilities. 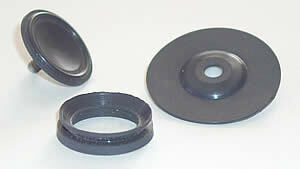 Bonded PTFE or all-rubber diaphragms for mechanically operated valves. Applications: On/Off flow control and actuated valve. Teflon™ is a DuPont registered trademark for a series of fluoroplastic resins comprising polytetrafluoroethylene. These resins are commonly referred to as PTFE/TFE, mTFE for modified PFTE, PFA or FEP depending upon their chemical makeup. Tempron’s experience with all of the different resins and their manufacturers allows us to meet your specific requirements and assist you with your designs. 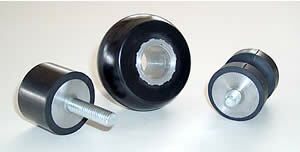 We have 25 years of experience in bonding PFTE films to rubber. We have developed proprietary processes to form thin-walled diaphragms, seals and multi-thickness parts that are difficult to machine or mold. 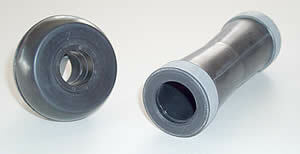 PTFE or MPTFE bonded to rubber for sanitary piping systems. Application: Pharmaceutical, ultra pure, food processing, aggressive chemical environment, maximum solvent resistance. Tempron has expanded its fluoroelastomer capacity to include perfluoroelastomer (similar to Kalrez®, Chemraz®) parts. 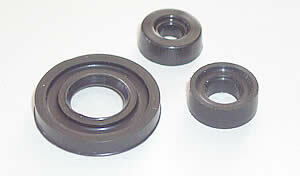 Parts molded of perfluoroelastomer provide maximum chemical and solvent resistance approaching PTFE. Tempron has 30 years of experience in the molding of Fluoroeslastomers (Viton®, Fluroel™, Aflas®) for seals and diaphragms. Hydrogenated Buna-N High temperature resistant oil and fuel applications; Improved strength, plus high temperature and low temperature resistant oil and fuel applications. 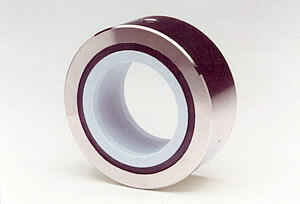 Tempron Products Corp. produces exceptionally high quality rubber bonded products for demanding environments, and our expertise lies in bonding PTFE/TFM to rubber for diaphragms and seals.